Results from a phase III study of Alcobra's MDX in adult ADHD are expected within the next week. BOSTON (TheStreet) -- Today I thought: Adam, since you like talking to yourself about biotech stocks, I was hoping you could help me figure out Alcobra (ADHD . The announcement of results from the phase III study of metadoxine extended release (MDX) in adult attention deficit-hyperactivity disorder is a week or so away. Wait, Alcobra's ticker symbol is ADHD and it's developing a drug for ADHD? That's clever. Agreed, but I want to know if MDX is going to work in this study.I don't know. I'm sorry, but maybe I can still help. I spent a good bit of Tuesday going over the MDX data from the previous adult ADHD studies, and more importantly, speaking with a bunch of institutional investors long and short Alcobra going into the phase III study results. It was an interesting day. Everyone is nervous. Alcobra bulls I spoke with believe MDX can pull out a win in the ADHD study but they also acknowledge significant risks. They're not going into the study-result announcement without a strong hedge for protection from failure. Likewise, the Alcobra shorts believe the MDX study fails, but they're equally unsure and hedged. The worries you hear from both sides of the stock stem in large part from a lack of understanding about how or why MDX improves attentiveness, the key feature of adult ADHD. Basically, it's a chemical variant of vitamin B6 formulated into a once-daily, extended-release pill. An immediate release formulation of metadoxine has been around for more than 30 years, approved in a handful of countries (not the U.S.) to treat alcohol intoxication. Alcobra acknowledges the precise mechanism of action for MDX in ADHD is unknown, although vitamin B6 is believed to play a role in the production of certain neurotransmitters in the brain. Alcobra bulls worry about the ill-defined mechanism of action for MDX but take comfort in robust and positive findings from phase II studies in ADHD. There are many approved drugs with mechanisms of action not well understood. Bears, of course, take the opposite view. They can't conjure a scenario under which any variant of vitamin B6 plays a legitimate role improving attentiveness in ADHD patients, or anyone for that matter. For this reason, Alcobra bears look askance at the MDX phase II studies. The positive results claimed by Alcobra are a mirage that won't be replicated in the larger, phase III study, shorts believe. The Alcobra/MDX story sounds a bit like Medivation (MDVN and Dimebon. Dimebon came up often in my conversations with Alcobra bulls and bears. For those who don't remember, Dimebon was an old, Russian antihistamine brought over to the U.S. by Medivation and transformed into a super-promising Alzheimer's disease drug based on a positive phase II study in Russian Alzheimer's patients. Medivation ultimately licensed Dimebon to Pfizer (PFE for some big bucks. Both companies insisted the phase II data showed clearly that an old, Russian antihistamine could improve memory and function in Alzheimer's patients. Unfortunately, when the Alzheimer's phase III studies were conducted in the U.S., Dimebon turned out to be a complete zero. Naturally, Alcobra bears say MDX is the next Dimebon bust because MDX is vitamin B6 and the phase II studies were conducted in a couple of Israeli hospitals by an Israeli-based company. Bulls also mention the Dimebon precedent as a concern, but Israel is not Russia (in a good way) and two of Alcobra's top executives joined from Shire (SHPG , where they worked on Vyvanse, the market-leading ADHD drug. The MDX phase II studies were also overseen by Dr. Lenard Adler of New York University Medical Center, considered one of the top ADHD experts in the U.S.
Can you walk me through the MDX phase II studies in ADHD? Absolutely. I'll focus on the phase II study dubbed "AL008" by Alcobra because it's the largest completed study of MDX in ADHD to date. The AL008 study results were published in the Journal of Clinical Psychiatry in December 2012. A follow-up analysis of the same study was published in the Journal of Postgraduate Medicine in May 2013. As you can see in the left graph, treatment with MDX for six weeks resulted in a 12.5-point reduction in the CAARS score compared to an 8.9-point reduction in the placebo arm. The difference was statistically significant. On a prospective basis, the study also looked at the effect of MDX on a subgroup of enrolled patients with the predominately inattentive (PI) form of ADHD. 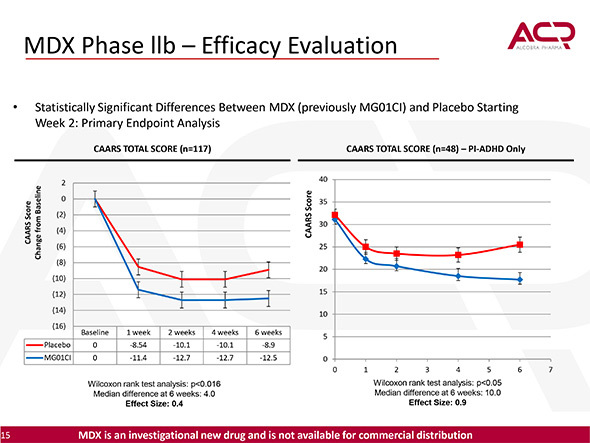 In this analysis depicted in the chart on the right, MDX demonstrated a greater reduction in the CAARS score compared to placebo. This is significant because a majority of adults diagnosed with ADHD fall into the predominately inattentive subgroup, as opposed to hyperactive or combined inattentive/hyperactive. So, the MDX phase II study was positive? Yes. MDX achieved the primary endpoint. Secondary efficacy endpoints, which assessed ADHD control with other ratings scales, also largely favored MDX over placebo with statistical significance. MDX was also found to be safe compared to placebo, with no concerning side effects. And yet there's controversy over the looming phase III study? I don't get it. Alcobra bears I spoke with Tuesday acknowledge the MDX phase II study, taken at face value, appears positive and clean. There aren't obvious red flags or data stink bombs hiding under the cover of the positive results. Still, the credibility of the study is questioned somewhat because the mechanism by which MDX (Vitamin B6) improves attentiveness is not obvious. This leads skeptics to wonder if what we're really seeing in the phase II is a placebo effect. The phase II study was also conducted entirely in Israel at only two hospitals, which could have helped skew results. One more point to make about the phase II study: In a later analysis of the AL008 study (the Postgraduate Medicine article), the statistically significant benefit demonstrated by MDX via the CAARS score reduction was driven entirely by adult ADHD patients with the predominately inattentive (PI) subtype. These PI-ADHD patients comprised about 40% of the phase II study. The rest of the patients were diagnosed with combined ADHD subtype (ADHD-CT), but they did not benefit from treatment with MDX compared to placebo. Alcobra bears look at these results by ADHD subgroup and scratch their heads even more. If it's unlikely that MDX (vitamin B6) does anything positive for ADHD patients, it's completely ridiculous to believe MDX only works in a subgroup of ADHD patients. All other approved ADHD drugs have demonstrated equivalent efficacy across the ADHD subtypes. Alcobra bulls look at the same data and say MDX's primary benefit is to improve focus (or reduce inattentiveness), therefore it's not totally surprising to see the drug have more benefit in ADHD patients whose main symptom is inattentiveness. But at the same time, Alcobra bears admit there isn't a logical reason for MDX not working at all in the other ADHD subtypes. This is a worry. I now understand why the MDX phase III study is so important. Alcobra designed the phase III study of MDX in adult ADHD to essentially replicate and confirm the AL008 phase II study. The study design and endpoints are the same. The most important difference with the phase III is more patients -- 300 versus 120 in the phase II -- and location. About 80% of the patients in the phase III are being enrolled and treated at U.S. hospitals. On Sept. 19, Alcobra announced the completion of all patient visits in the phase III study. The statistical analysis should be done in the next week or so, with results announced soon after. When Alcobra does announce results from the phase III study, what should I look for? The primary endpoint of the study, like the phase II, is change in the CAARS score from baseline to 6 weeks, comparing MDX 1400 mg to placebo in adult ADHD patients. If the MDX benefit observed in the phase II study was real, it should be confirmed in the larger phase III study. Do you expect any spin if the study fails? Spin is always a possibility when a study fails. Like the phase II study, the phase III study also allows for a prospective analysis of MDX's effect on adult ADHD patients with the predominately inattentive subtype. If MDX fails to improve ADHD symptoms in all the patients, there's a chance the drug works only for the PI-ADHD subgroup. Or, that's what Alcobra might announce. Absence a clear rationale for why MDX would work in one group of ADHD patients but not others, it's hard to see how FDA would agree with any nuanced victory claim from Alcobra and its supporters. Without a clear, statistically significant result in the phase III primary endpoint, Alcobra and MDX will become mired in even more controversy. Lastly, remind me again about the prize for Alcobra at the end of all this work. How big of a commercial opportunity does MDX represent in ADHD? I don't have independent numbers at hand, but Alcobra says sales of all ADHD medicines in the U.S. totaled $8.3 billion last year. Adult ADHD is now half the market and actually growing faster than pediatric ADHD, the company says. At Alcobra's Tuesday close of $20.25, the company's market cap was $277 million. If the phase III study of MDX is successful, Alcobra shares are going a lot higher. The company must still conduct a second phase III study but I think most investors will assume the drug works and there's a lot of money to be made selling a new ADHD drug. Alcobra owns all rights to MDX? It does today, but at one time, MDX was partnered with Teva. In November 2011, Teva relinquished development and marketing rights to MDX after seeing the results from the phase II AL008 study. Alcobra bears point to Teva's exit as a red flag, bulls says Teva at that time was a dysfunctional mess of a drug company and made a mistake letting MDX rights expire. We'll know soon enough which side is right.